When I was younger I was a big fan of books where people my own age started their own detective agencies. My favourites were the Three Investigator books, which remained a mainstay of my reading into my teens, even when the rest of my tastes were getting decidedly more blood-soaked. I wanted to live in a junkyard and have a secret office hidden by a pile of junk. Their plots were a little safer (missing objects, etc) than the storyline of the first Wells and Wong mystery, which starts with the murder of a teacher at the Deepdean girls’ boarding school. Hazel Wong finds the body of Miss Bell spread-eagled on the floor of the gym. She runs to get help, not least from Daisy Wells (President of the Detective Society, for which Hazel is Secretary – though really there are just the two of them anyway). When students and staffs descend on the gym, however, the body is gone. As Daisy and Hazel deduce, it can’t have been an accident (or suicide), because someone has obviously tried to cover it up. 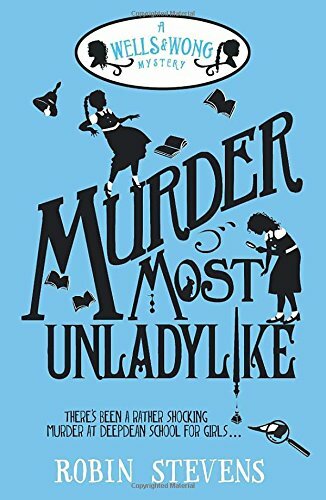 With a mysterious resignation note showing up, nobody else believes Miss Bell is even dead, let alone murdered, so it’s down to Daisy and Hazel to solve the crime on their own. The story is set in that timeless version of quintessential England that probably didn’t even exist in the early 1930s, but it offers Robin Stevens the chance to affectionately pastiche Agatha Christie’s oeuvre. There are a few herrings so red they are practically neon as Daisy and Hazel work their way through the teaching staff, establishing who has motive and who is protected by an alibi. At one point things seem to be getting all Murder on the Orient Express, with everyone – perhaps even a couple of students – having a possible reason to want to snuff out Miss Bell. Daisy and Hazel are a teenaged Holmes and Watson, with Hazel writing up the case and Daisy hanging over her shoulder, improving the text from off the page. They bicker, they fall out, they realise they need each other to solve the case. It’s a sparkling relationship that pushes the book onto another level. This is the first in a series and I’ll certainly be checking out the others. Thirty-nine-year-old genetics professor Don Tillman decides it’s high time he found a wife and settled down. He doesn’t have much time for or interest in conventional dating methodology, and that’s not gone particularly well for him in the past, so he decides to treat the wife search like any other scientific project. He devises a detailed forensic questionnaire that potential mates can fill in to apply for the position of Mrs Tillman – though it’s mostly designed to help him weed out unsuitable candidates without actually wasting his time getting to know them in person. Applicants prove a little more difficult to assess remotely than Don was expecting, so he enlists the help of his romantically successful (i.e. lecherous) academic colleague Gene to help pick dates. When a somewhat flamboyant younger woman named Rosie, who is not only a vegetarian but also likes a cigarette (both of which should have ruled her out instantly), shows up at Don’s office, he thinks Gene is playing a practical joke. 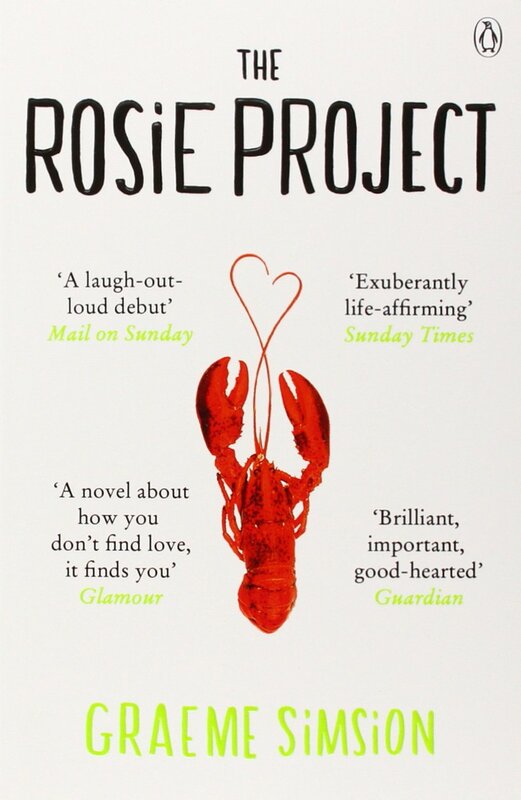 But Rosie isn’t actually there for the Wife Project. She doesn’t know anything about it. She is there because she needs help in tracking down her real father (and in proving to the lucky man that he actually holds that honour) and is hopeful a genetics professor with access to DNA testing equipment can help. Don inadvertently finds himself involved in an increasingly madcap mission to take surreptitious DNA samples from all the likely suspects. In fact, Don finds himself enjoying spending time with her so much, it’s just a pity Rosie is so damn unsuitable. Whilst it loses a bit of its edge and heads into more conventional romcom territory towards the end, this is the first novel in quite a while that has required me to disguise a snort of laughter as a sneeze when reading it on the bus. The extreme lengths to which Rosie and Don go in trying to acquire the many DNA samples stops short of becoming farcical thanks to Don’s dry, unintentionally deadpan, sometimes even clinical narration. Don is as hapless as Adrian Mole, but without any of the pretension (indeed, Don actually is a genius – just not in interpersonal relations). Graeme Simsion hints at but never belabours the idea that Don is somewhere on the autistic spectrum, in the same way that The Big Bang Theory never diagnoses Sheldon Cooper. Don has many of the same idiosyncrasies as Sheldon, but the humour comes from his disastrous attempts at romance and his misunderstandings rather than obnoxiousness. Ultimately it’s a love story of the ‘opposites attract’ variety. Whether it’s plausible that a young free spirit like Rosie would spend any time with an oddball like Don if they didn’t have a mission is not the point. It’s a feel-good story without too much schmaltz, and I’ll definitely be checking out the sequel.